Slow-Cooked Baby Back Ribs Dinner Party! 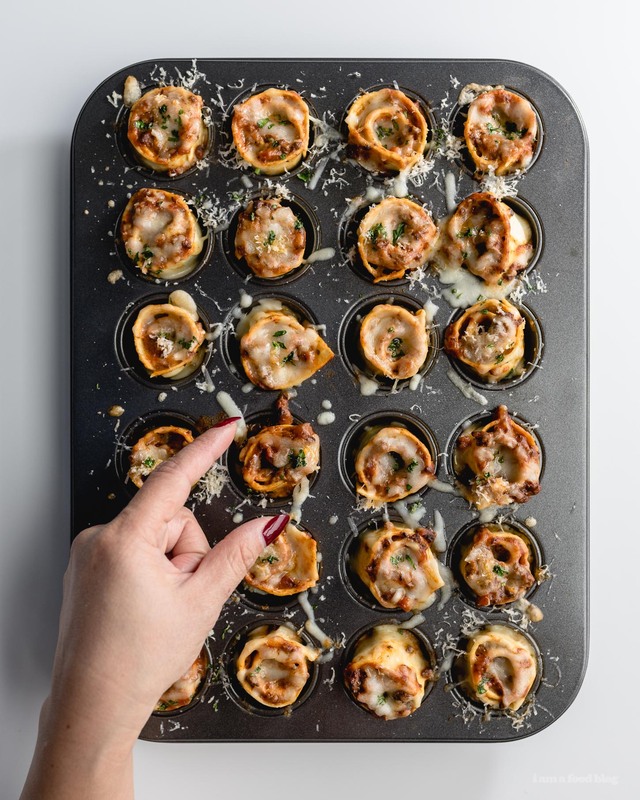 Is there anything better than handheld lasagna bites? I think not! 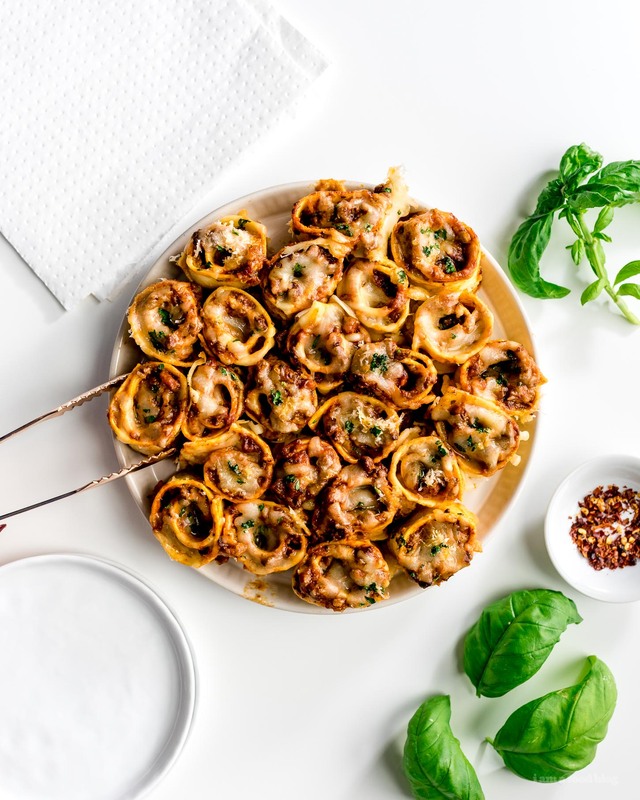 Cheesy meat-saucy addictive one bite mini lasagna rolls ups, here and waiting for you. I think lasagna might be one of my favorite ever pasta dishes. It might be a hold over from when I was little, but most likely it is just because it is so good. When I was small, my brother was obsessed with lasagna. It might have been because of his love for Garfield, but maybe he, like everyone else in the world, loves baked noodles, sauce, and cheese? I’ll have to ask him. Anyway, for that reason alone lasagna really reminds me of childhood and all that is right in the world. 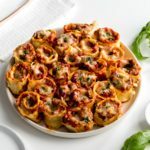 I’ll take lasagna in any form I can get: mini lasagna cups, kind of fancy dinner party lasagna, or lasagna of the roll up variety. But, I think I may have happened on the ultimate lasagna form. 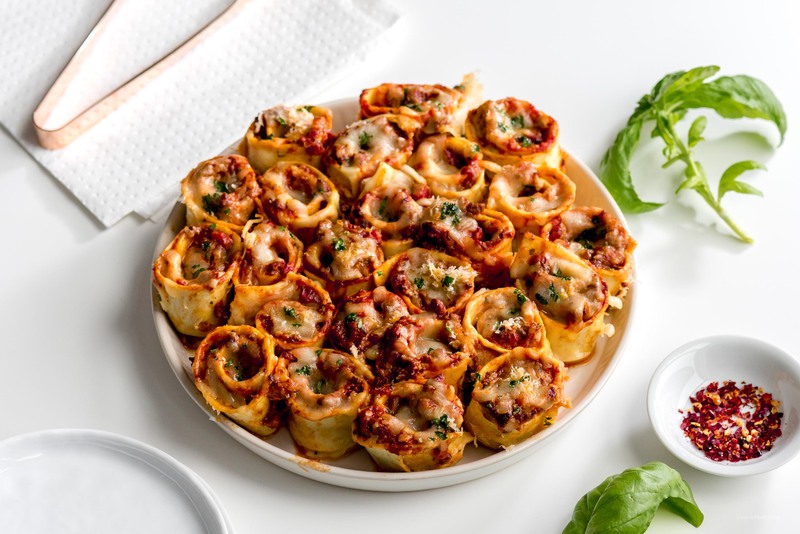 I present to you, one bite mini lasagna roll ups! 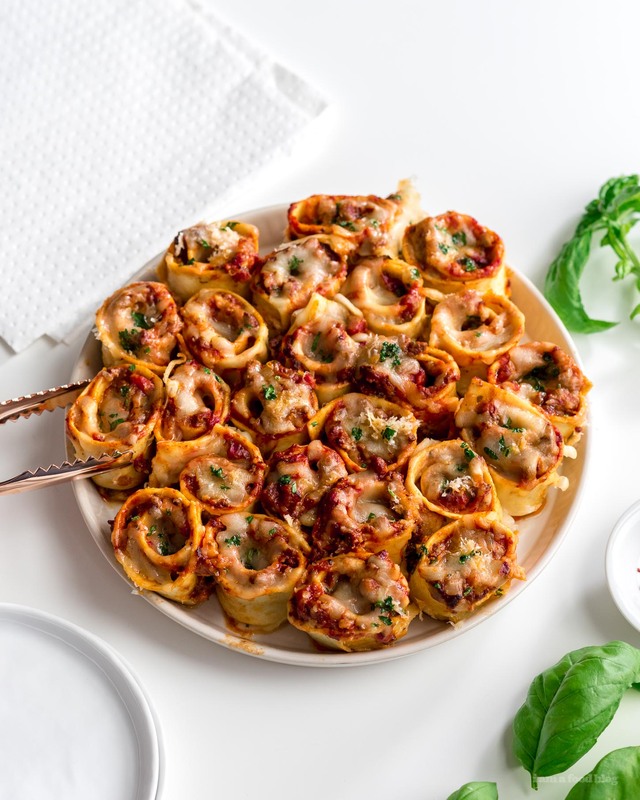 Each roll up is a perfect one bite trifecta of sauce, noodle, and cheese. I love how cute they are, how perfect they are for parties, and how they taste great warm or at room temperature. They were so good Mike and I kept saying to each other, okay, only one more. Then, all of a sudden, the entire plate was gone and there were no more “one mores” to be had and I was very sad so I made them again the next day and then again the day after that. By that time I still hadn’t had enough lasagna bites but I had practically eaten a whole lasagna by myself so I told myself, enough. But really, there’s never enough lasagna because lasagnas are noodles and noodles are my everything and I try to live that noodle life whenever and however I can. Sprinkle a bit of cheese into the bottoms of a non-stick mini muffin tray. 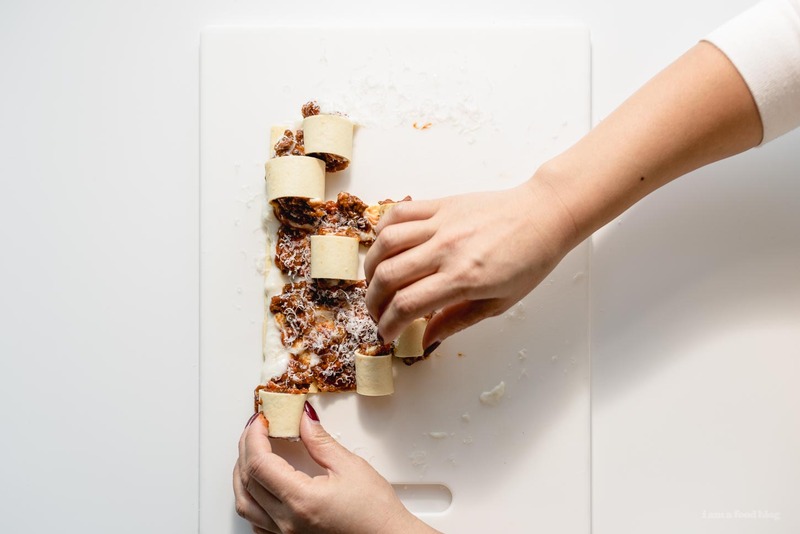 As it melts and gets crispy, the cheese will help hold your lasagna roll together so you can just pick it up and eat it. Cook the noodles according to the package and drain. 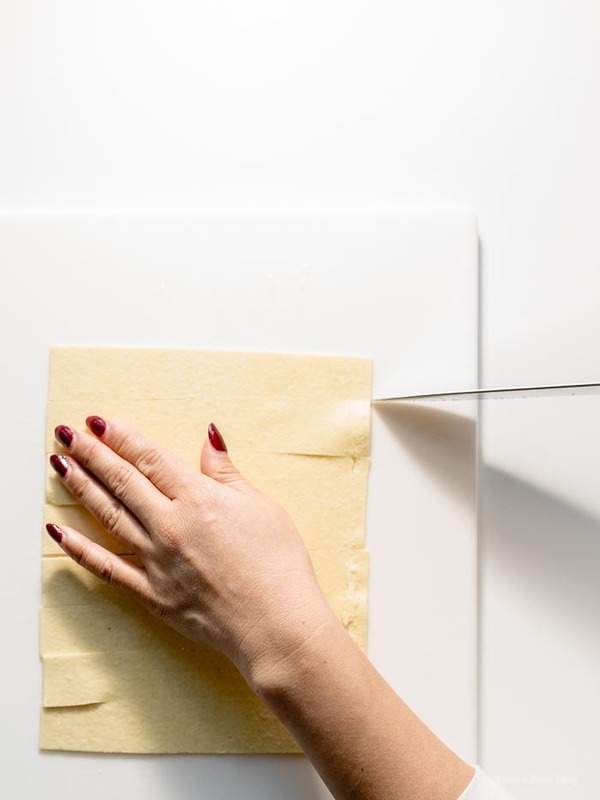 Cut noodles into strips about 1 inch in height and 4-5 inches in length. I used fresh lasagna noodles sliced into eight width-wise. 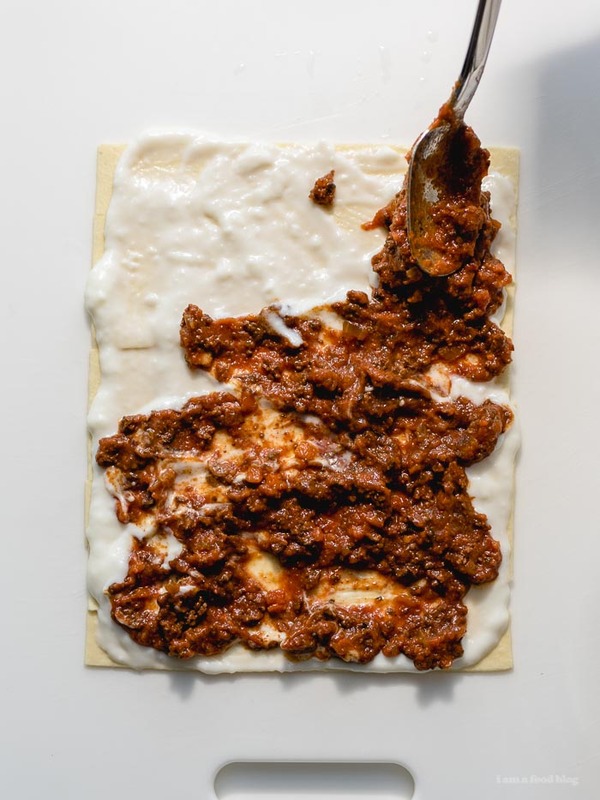 Regular lasagna noodles would work too, sliced in half length-wise, then again in half width-wise. On the lasagna strip, spread on a bit of bolognese, then béchamel, then a light sprinkling of parmesan. Roll up tightly then pop into the prepared mini muffin tin. Repeat until all of your sauce and noodles are finished. Top generously with shredded mozzarella and whatever parmesan you might have left. Bake for 30 minutes or until the cheese is golden and toasty. Let cool in the pan for at least 5-10 minutes, then use a plastic offset spatula to pull them out. Top with flat leaf parsley if desired and enjoy! In a small sauté pan or skillet, melt the butter over medium heat. Add the flour and stir constantly for 1-3 minutes, until completely smooth and incorporated. Pour in the milk in a thin stream while whisking. It might start out lumpy, but keep adding the milk and whisking and it will smooth out. Keep on medium heat, stirring occasionally, for about 5-8 minutes, or until the sauce thickens. Oh, how brilliant are these! Wow, this is such a great idea and so well photographed! thank you tori! they were so delicious! Yay. I have been anxiously awaiting this recipe. Hehe. I wonder tho if I could just skewer them and put in the oven if I don’t have a mini muffin pan or if I need to make these on a larger scale. i think skewering them would work, depending on how tender you cook your pasta. otherwise, you can put them all in a regular baking pan, snuggled up against each other. they’ll just be more pull-apart than individual. this surely sounds so exciting… vl defineteiy try..